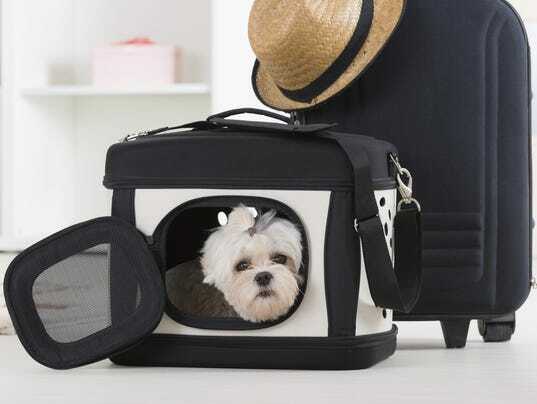 Some important considerations when flying with your pets this Holiday season. With the holiday travel season in full swing, it's a good time to consider expert advice on how best to manage your itinerary. After all, Thanksgiving through New Year's spans some of the busiest days of the year for commercial flying in the United States. But for those whose family includes furry members, it's also a good time to consider whether four-legged loved ones should fly at all. It's an issue that has been back in the news in recent weeks, after passenger Frank Romano's dog was lost by Delta Air Lines in Los Angeles on Halloween, allegedly after chewing through a plastic kennel. Can some animals travel safely, either in the cabin or the belly of an aircraft? Yes. But it's a more complex issue than many pet owners realize, so a little research can be critical. Since I last addressed this issue here in 2009 with "What you need to know about flying with pets," there has been an increase in guidance from animal care experts. There also has been additional evidence of the dangers, with more robust government statistics on animals that have been lost, injured or killed while in the care of U.S. airlines. Some pets should not be flying at all -- ever. The American Humane Association advises: "As a general rule, puppies and kittens, sick animals, animals in heat and frail or pregnant animals should not travel by air." Furthermore, the Humane Society of the United States warns "air travel is particularly dangerous for animals with 'pushed-in' faces," such as bulldogs, pugs and Persian cats; some airlines will not accept them. In addition, during this holiday season, some regions of the United States will be too cold for pet travel, while other regions will be too hot, making the booking process quite difficult. Minimum and maximum temperature guidelines apply, and they also apply to connecting cities along the way. Last year I assisted some family members who relocated to Central America by shipping their dog to them; although it was a crisp fall day in Newark and not particularly hot at the destination, the airline refused to board the dog because the temperature was soaring in Miami, the connecting hub. All four of these organizations also provide advice for those who travel by alternate modes, such as car, bus, train and ship. It's important to note pet travel policies usually don't apply to service animals, andexceptions may apply for U.S. military and State Department personnel. First things first: Before you query individual airline policies, you need to review governmental restrictions. The U.S. Department of Transportation provides guidelines on Transporting Live Animals for both owners and shippers at its site. In addition, the Federal Aviation Administration features a Flying with Pets page; it includes critical information on security screening and rules for pets in the passenger cabin. For those traveling with pets in foreign countries -- or importing or exporting pets -- there are specific requirements, detailed by the U.S. Department of Agriculture. For a rundown on foreign rules, country-by-country regulations are provided by the industry's global trade organization, the International Air Transport Association. Once you've addressed all these issues, you'll need to learn the specific policies of the carrier you'll be booking, since they do vary. (So do the perks, such as frequent-flier mileage for four-legged friends.) Each airline has its own rules on which animals it will and will not carry, specific regulations for cabin and belly travel and policies on containers. Of course, in this golden age of airline "ancillary revenue," fees can vary for such services. * In this age of airline consolidation, it's worth noting American specifically states its merger partner US Airways has "different policies on pet travel." So how do these domestic airlines perform when it comes to handling your furry fellow travelers? Thankfully, for nearly ten years now U.S. carriers are required to report all incidents to the DOT, and those reports are viewable to the public, though some animal lovers may find them tough reading. U.S. airlines not listed did not report any anomalies last year. However, what remains unclear is the total number of animals carried by each of the airlines, so consumers can't analyze these statistics on a proportional basis. But since the totals for Alaskaand United are so significantly higher than for all other domestic airlines, it can be instructional to view the detailed incident reports linked above. • The first step always is checking with your veterinarian to see if your pet is healthy enough to fly. • For those seeking to transport a pet without accompanying it, the International Pet and Animal Transportation Association offers pet owners advice on finding pet shippers, as well as warnings about pet scams. • By the way, some well-meaning sites suggest you book a "direct flight," not realizing that in airline-speak direct flights make stops en route; ideally, you'll want to book a "nonstop flight," though this may not be possible in many cases. It's also important to know if all legs of an itinerary will be operated by the same carrier or a codeshare partner, particularly since so many domestic routes today are serviced by regional partners.